All girl Japanese heavy metal group LOVEBITES have finished work on their first full album, Awakening From Abyss. LOVEBITES consists of five talented women who are already making a name for themselves across the globe. The US edition of the album will be available via Sliptrick Records on October 25th on CD and digital formats. 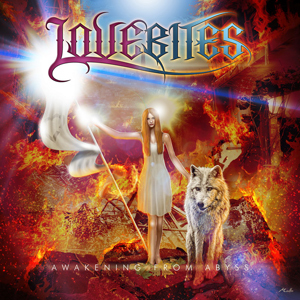 The highly renowned European engineering team of Mikko Karmila and Mika Jussila, who worked on The Lovebites EP, returned for Awakening From Abyss and once again, the album was mixed and mastered at the legendary Finnvox Studios in Helsinki, Finland. Expect the bar to be raised even further with this release which promises even greater dynamics in the sound. Tha band recently released a video for the track "Don't Bite The Dust" and you cna watch it now on KNAC.COM HERE. The album’s cover features artwork by David Lopez Gómes, an acclaimed and well-known artist. His work has featured in the German metal band HELLOWEEN’s 30th anniversary book Hellbook and the group’s best of album, Sweet Seductions. The Awakening From Abyss cover features a goddess standing on the ruins of a destroyed world preparing to give birth to a new world which both visualize and further emphasize the concept of the album. Along with the new album comes an important change to the band. The lead guitarist and keyboard player Mi-ya, who was a support member and co-composer on The Lovebites EP, is now a permanent member of the band.